How many afternoons about 3:00 are you sitting at your desk at work, scrambling for ideas for dinner? How many Sundays do you promise yourself that you’ll make out a weekly menu and actually plan ahead? How many of us simply are too busy to plan, even though it would save time in the long run? While struggling with these dilemmas, I came across FoodDJ.com. It’s a pretty cool site. After signing up for free, a monthly calendar of recipes is generated for you, based on some key food terms/items you select during the sign-up process. You give the recipes a thumbs up or thumbs down. If you give it a thumbs down, it’s replaced with another recipe. Once you’ve found a recipe you like, simply click on it, and it opens in a pop-up window. You can then edit and/or delete items. Pretty cool! 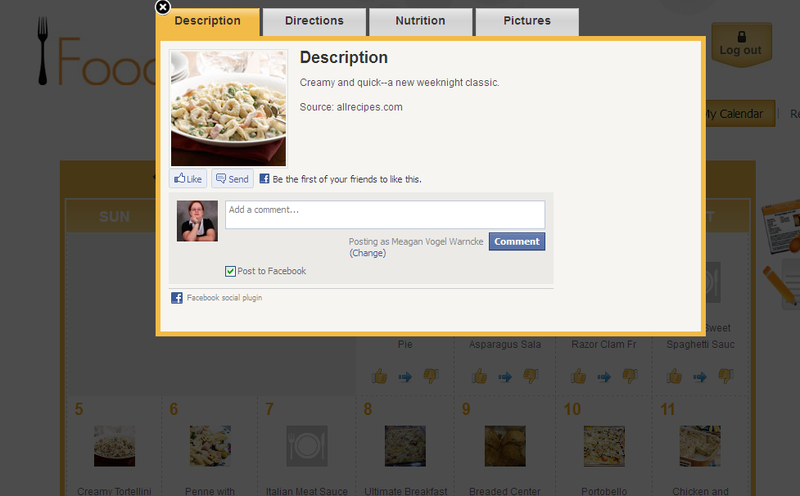 It also lets you add your own recipes to share with others on the site. Nice write up! This site is definitely a bit better then some of the other recipe sites I have come across recently. I think that it is a really neat concept. The psychology of choosing recipes on a calender works better for planning and shopping for meals than just putting everything on a list. The recipes are very simple and easy to prepare. I like it!